I love irises! They are very pretty as they come in all colors. If I consider all the irises in my yard, I will have bloom from the beginning of May thru the end of July. Now that is wonderful! Irises are easy to care for, divide easily and many many varieties are available to purchase. Because there is a very poor selection of iris to purchase in local nurseries in the Brandon area, I have joined the Can West Iris Society and also have taken part in numerous group orders to iris hybridizers and iris nurseries in Italy, the United States and Canada. Doing so has been a complete joy and especially when they start blooming in my own yard a year or two after purchasing them. As I go thru my pictures and find various irises to input, I have come across a few that I received that either had no name to start with or came misnamed. Those I will place in a NOID section (No Identity). Some of them are simply beautiful, so I wish they had names. If you have any idea what they are, please let me know. Thanks. 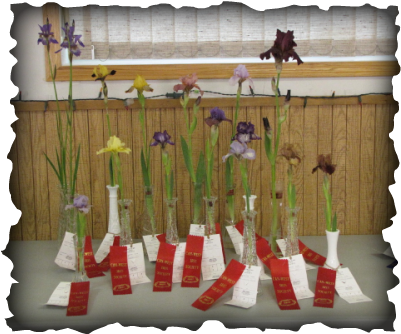 The Can West Iris Society has an iris show each year, in June, in Winnipeg. For the past few years I have participated in it. Last summer, June 2011 and the summer before, I was awarded with the top award... for the most first places at the show. That was quite an honor! In the 2012 show I placed third, but had the best IB in the show with Raspberry Blush. I am now starting to hybridize irises, choosing both the 'mom' and the 'dad', so look for seedlings in the future! 14 red ribbons in June 2010!